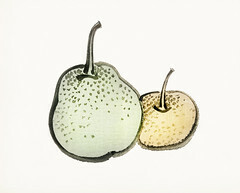 Asian pears by Kōno Bairei (1844-1895). Digitally enhanced from our own original 1913 edition of Barei Gakan. Illustration from Bairei Gakan by Kōno Bairei. Free download under CC Attribution (CC BY 4.0). Please credit the artist and rawpixel.com.